Scalapino’s photo-texts are characterized by a sense of “writing against” the image. The images in her photo-texts bring objects, events, and places to the literary text that the writing does not simply attest to or authenticate. In his eyes, “the juxtaposition of photos and texts… enables certain readings/viewings, but in the end delivers closure to none.” Bremmer’s dense essay covers a lot of territory and infuses no small amount of Foucault and Barthes into the mix. But in essence, he seems to be saying that Scalapino doesn’t give the photographs and texts a predetermined relationship to each other. They don’t explain or illuminate each other in any way that we typically expect words and pictures to interact on the page. Instead, the reader is given the assignment of providing ever-shifting contexts with each reading. “Scalapino’s poetry presents an incessant, subversive process of locating the self in writing.” I take the use of “self” here to mean not just Scalapino the writer, but all of us as readers. I suppose it could be said that the reader must always be in the process of locating himself or herself in the text during the act of reading – no matter what the text. It’s just that here we are confronted with an artist who makes the tangled nexus of language and meaning the explicit concern of her poetry. Here’s the opening of the final section of The Tango. Bremmer points to the indexicality of Scalapino’s work as both the source of confusion for the reader and a key element in her strategy of showing us how language works unmoored from context. The Tango is full of pronouns – he, they, it – and references to direction that cannot be clearly linked to anything else in the text or in the images. 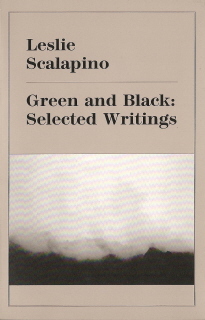 When I first read Scalapino, I was tempted to think of her language as abstract, like a solid wall of words stripped of or resistant to meaning. Slowly, however, her work has evolved for me. It seems more organic. It helps to read the work out loud or to listen to Scalpino read and one suddenly wonders if this isn’t somehow related to the way the brain works, using bits of language and images to build up meaning, not in a linear fashion but simultaneously, stutteringly, from many directions. Many links to Leslie Scalapino reading can be found at the University of Pennsylvania’s Center for Programs in Contemporary Writing website. 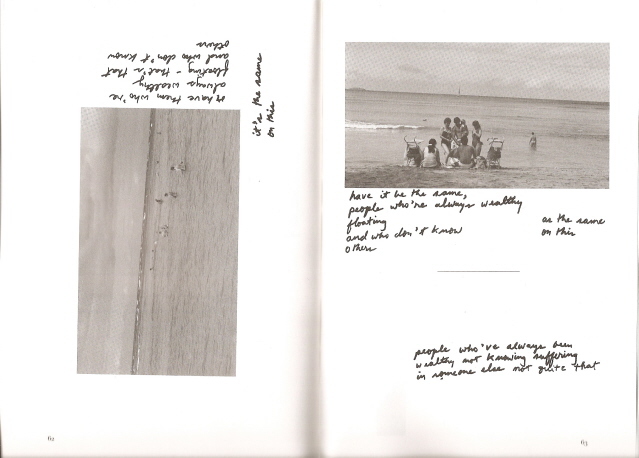 How does a poem function that consists of handwritten texts interspersed with photographs? When the texts can face any direction on the page, including upside-down? When the photographs – which are amateur snapshots – are cropped to many sizes and can also be stood on their sides? When the written text refers to “wading in the grass,” a drunk, a corpse, and assorted other seemingly unrelated subjects, while the photographs depict people standing on sandy beaches or wading through low, gentle surf? On one level, such a poem functions pretty much like any other dense, highly allusive, self-referential poem that demands constant reassembly as we absorb the words. 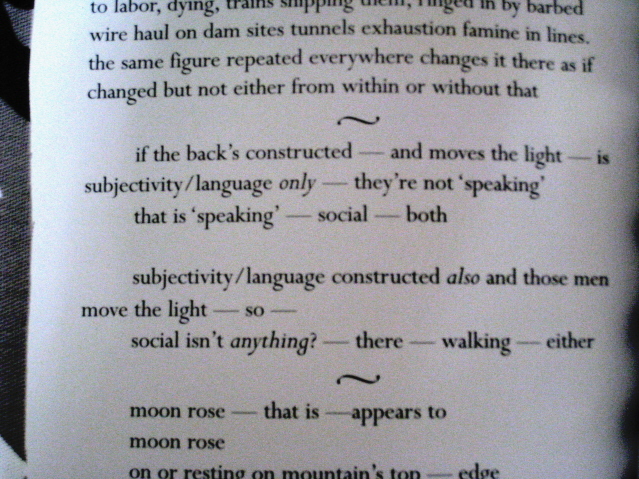 But in this case – and I’m referring to Leslie Scalapino’s book-length poem Crowd and not evening or light – the poem also exists on a totally different level where it is the very nature of meaning itself that we are forced to reassemble as we read. There are some clues on how to proceed. Take the word “trunk,” for example, which appears over and over throughout the written text, referring to an elephant’s trunk, the human torso, and unnamed human appendages which can appear like trunks. In the photographs we can see the torsos of people as they walk and wade, but we also see their swimming trunks and the trunks of trees near the beach, neither of which appear in the writing. This is just one of numerous ways in which Scalapino reminds us that meaning is dependent on context. What Scalapino often does in her poetry is force language into the process of losing its anchor in context, letting it start to float free. Crowd and not evening or light (Oakland: O Books, 1992) contains 76 photographs by the poet. Several years later, Scalapino excerpted two of these photographs and their related texts in an anthology of her work called Green and Black: Selected Writings (Jersey City: Talisman House, 1996). I’m not sure what this implies, but the two sections of the poem she excerpted were not contiguous, as if she were excerpting two different stanzas – one from page 85 and one from page 91 – rather than an uninterrupted segment. In a recent post I wrote about another book-length poem by Leslie Scalapino, also with embedded photographs, called The Tango. 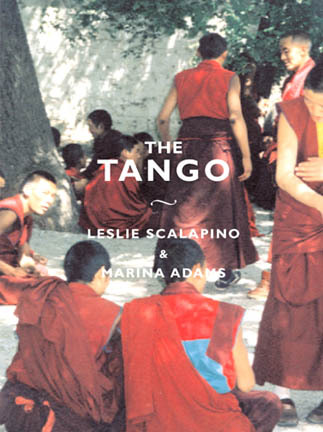 Leslie Scalapino’s book The Tango (NY: Granary Books, 2001) interweaves her own poetry and photographs, along with artwork by Marina Adams, into something that feels as light and airy as a spiderweb but can also be as resistant as kevlar. Measuring about 13 by 10 inches in size, the book itself is not a typical or intimate volume of poetry. Scalapino’s work is elusive. 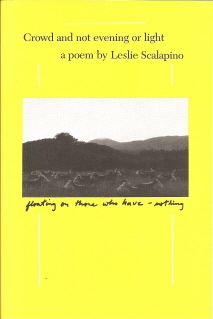 It’s ultimately fruitless to try to divine what the poem might be “about”, since Scalapino’s real subjects are language and communications and what it means to be social beings. She uses phrases, cliches, fragments, and single words rather than full traditional sentences and she forgoes traditional grammar. Her poems are full of quotation marks, italics and other typographical elements. When I read her poems with all their chopped up elements, I find myself rearranging and realigning the components like a Rubik’s Cube, trying to find meaning. The sequence of photographs in The Tango was shot in a Tibetan monastery. The photographs take on the form of a cinematic dance as the camera follows a number of young monks who congregate in a courtyard, debate, reassemble into new groups, think, listen, talk, sing, and dance. The physicality of the ever-changing group of monks hints at the unseen, unknowable discussion in which they are engaged and may also serve as a metaphor for the elusive nature of language and communication. I have come to think of Scalapino as someone who likes to takes complicated mechanical watches apart to see how they tick. The question I’m not prepared to answer is if her art stops at dissection of if she manages to put all the pieces back together in a pattern that I simply don’t recognize as a watch. Writers often deliberately make the world strange as a way of forcing us to look at the familiar in new ways. What Scalapino and others who are often lumped together as “language poets” do is make language itself strange so that we no longer take it for granted. This is a brave and lonely undertaking that makes for off-putting reading for all but a small readership. While there are many novels that have photographic images embedded within the text, I’m now only beginning to run across only a few volumes of poetry in which photographic imagery seems to be an integral part of a poem. The most recent is Anne Carson’s new book-length poem Nox (NY: New Directions, 2010), which I wrote about recently). Leslie Scalapino, an endless experimenter who died less than two months ago, wrote several books of poetry with embedded photographs. I’ll be writing about another title soon.